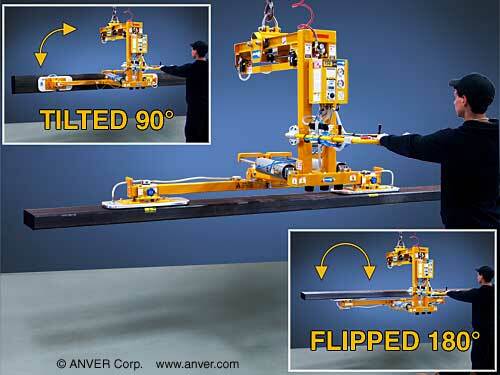 ANVER Corporation has introduced a new air powered vacuum lifter with 180 degree flip designed for one person to seamlessly lift, tilt, and flip over long, bulky loads made from non- and semi-porous material. 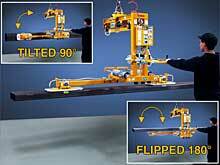 This load-flipping system is ideal for inspecting common sheet and plate panels. Product features include an adjustable bailwith a fully integrated operator control handle for easy maneuverability, an all-steel welded frame with dual air cylinders to rotate loads horizontally and vertically, and a locking attach/release valve and vacuum reservoir to maintain vacuum hold in case of a power outage. Other standard features include a dual air filter, an air Venturi vacuum pump, and mounted hand toggles that provide smooth, speed-controlled movements. This one-operator system will help reduce labor and increase productivity and safety in most work environments. Supplied with standard vacuum pads using rubber or foam seals, these below-the-hook upender vacuum lifters are available for loads up to 750 lbs. (340 kg). Price quotations are available upon request.